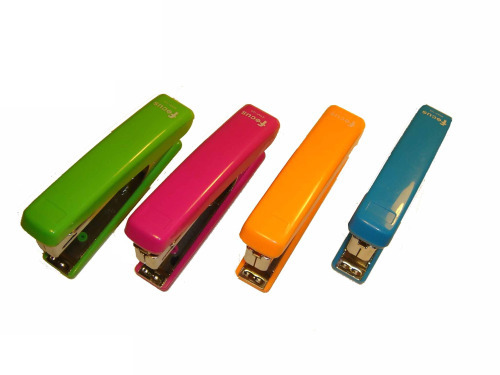 As beautiful as they might seem, staplers are very dangerous. Friday was great, don’t get me wrong! But after a day (Saturday) of riding my bike in the rain all over “tar-nation” (to get milk) and getting soaked, Sunday seemed like a fantastic fresh start. Little did I know that later that afternoon I’d be hostage to a whole lot of pain. So, when my Mom decided to throw a rummage sale, me and Sam were sent all over the neighborhood to put up signs. While on the corner of Howell and Oklahoma near a gas station with lots of traffic, Samantha dropped a sign and flew into the road. She was sent chasing it and in the process she dropped the stapler we were using. Guess where that stapler went? Right under my foot! When I stepped down I was shocked to see that a staple was in my foot! “Owwwwwwwww!” It took forever to pull it out and it hurt! Lesson learned. Don’t trust staplers or sisters.